The TNSNOW Good Wood winner, the GNU Carbon Credit BTX Snowboard features award winning easy to ride technology and is handmade in the good ol' U.S. of A. by weirdo snowboarders with jobs. The Carbon credit is a tool of progression and makes your life on the snow that much easier with its banana tech between your feet. 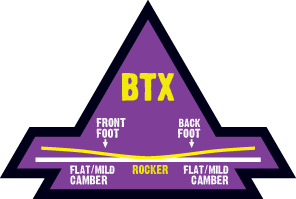 BTX – GNU's BTX rocker profile places rocker between your feet, that transcends from flat to mild camber out to the contact points (tip and tail). This mellow blend of rocker and camber results in smooth riding, responsive turning, catch free jibbing and an epic float in pow. Flex Rating: 4.5 (1 Soft - 10 Stiff) – This board has a forgiving flexibility rating of 4.5. Riders who use the entire mountain as their playground will benefit from this playful, versatile and damp flex rating. Sustainable Natural Fiber – GNU builds boards with fast growing farmed eco woods selected specifically for their long fibers, light weight, strength, long lasting pop and great feel. Wood is Nature's fiberglass. Co-Extruded Base – Hard, fast and virtually maintenance free. Loves a good wax job but still slides well when you forget to wax.